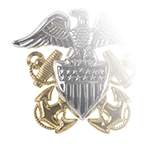 Designed for wear on the sleeves of the Coast Guard Auxiliary’s Service Dress Blue coat, this device is attached above the stripes designating elected Leadership positions at the Flotilla level (Commander and Vice Commander ), Division level (Commander and Vice Commander), and District level (Chief of Staff, Captain). This same device is also worn on the SDB coat without stripes by basic Members of the Auxiliary. 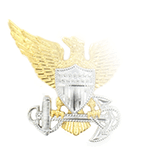 By statute, the Coast Guard Auxiliary is a non-military, all-volunteer organization and does not have Officers in the same sense as in Department of Defense organizations (Army, Navy, Air Force) or the U.S. Coast Guard (one of the nation’s five Armed Forces). Instead, its Officers and elected leaders provide administrative management based upon compliance with policies, procedures, and rules put in place by higher-level units in the chain of management and leadership. The Auxiliary employs a system called parallel staffing to populate the leadership positions at the different management levels, starting with the smallest (Flotilla) to the highest (National). At each level, Auxiliarists elect leaders, who then appoint Auxiliarists to serve as Officers. 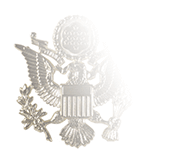 To distinguish between elected leaders and appointed officers, the Auxiliary uses a color-coding system with the letter “A” either inside an Auxiliary shield (metal devices, shoulder boards) or on an insignia similar to those of the Armed Forces (bars, leaves, eagle, stars). 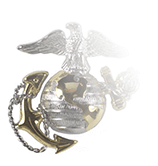 A red letter “A” always stands for an appointed officer whether inside an Auxiliary shield or an insignia. 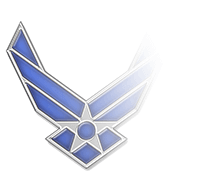 A blue “A” on an insignia or a silver “A” inside an Auxiliary shield indicates an elected leader. Lastly, embroidered insignia is placed upon fabric matching the uniform on which it will be worn.